I finished up a pendant I programmed for the Grand Rapids Comic Con this weekend. 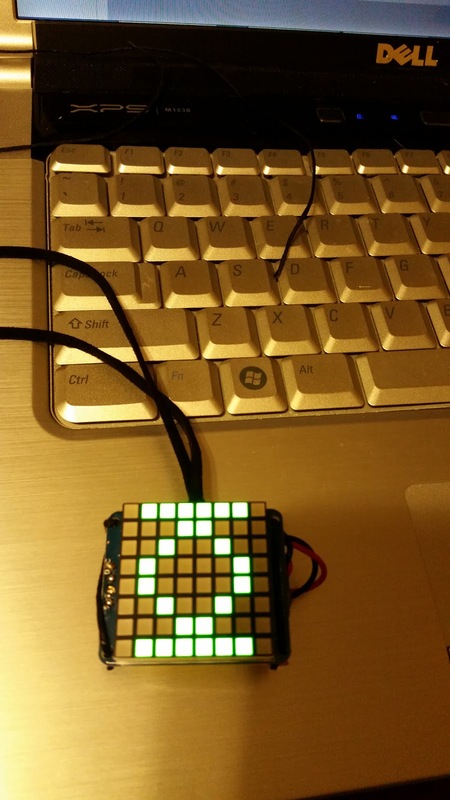 It's an Adafruit Gemma with a small battery soldered to an 8x8 LED matrix. It flips through a few different Justice League logos in a few different colors. Originally I had tried to program some different Zelda icons but a lot of them looked wonky on such a small grid. Quinn's arc reactor for his Iron Man suit is mostly done but we'll see if I can actually use it. He seemed uncomfortable with the costume since it has fake muscles and is puffy. So I may end up saving the arc reactor I soldered awhile back for another year if he truly won't wear the costume. 20 months is kind of pushing it expecting him not to grab a blinking light anyway.